By Michael Collins: Top Rank promoter Bob Arum sees nothing but dollar signs in proposed rematch between former WBC middleweight champion Julio Cesar Chavez Jr. (46-1-1, 32 KO’s) and Sergio Martinez (50-2-2, 28 KO’s) for early next year at the Cowboys Stadium in Texas. The pay per view numbers haven’t yet been released for last Saturday’s Chavez Jr-Martinez PPV fight but the word is that the fight did better than what the promoters Arum and Lou Dibella had hoped for. I don’t see it quite like Arum. I think the rematch will do well because Chavez Jr. is a popular fighter, and he’ll no doubt he able to pack the Cowboys Stadium with his devoted boxing fans from around the Texas area. However, I don’t think the Chavez Jr-Martinez rematch will do huge business on PPV, because the asking price was steep last Saturday night with a price tag of $49.99 for a card that was pretty much empty of big names and competitive fights. Then the fight itself between Chavez Jr. and Martinez was horribly one-sided for 11 1/2 rounds with Martinez giving Chavez Jr. a boxing lesson. 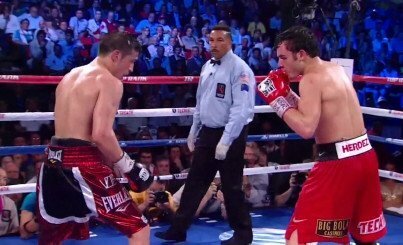 Chavez Jr. did come back in the last minute and half to drop Martinez, but that’s not enough to justify a rematch. Chavez Jr. lands a lucky punch, scores a knockdown but then can’t put Martinez away even under those circumstances. That’s enough to warrant a rematch. What Arum should do is have Chavez Jr. face some contenders and prove that he’s learned from the mistakes he made in the Martinez fight. If Chavez Jr. can show that he can work hard for three minutes of every round then I think it’s a good idea for a rematch, but not until then. I’m not surprised that Chavez Jr. and Martinez want to do the rematch because they both got good money for their fight last Saturday. But Arum needs to be thinking about the fans before he puts this mismatch back together. Previous boxing news: Maravilla or Canelo?